Cover letter example for a Mechanical Engineer job. You can amend this letter as suitable and apply for latest job vacancies. 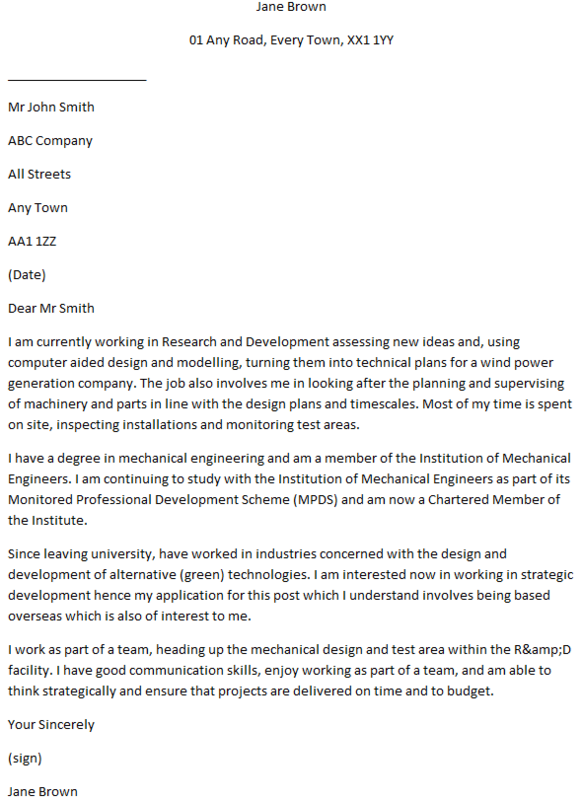 I would like to apply for the role of Mechanical Engineer as advertised recently. I am currently working in Research and Development assessing new ideas and, using computer aided design and modelling, turning them into technical plans for a wind power generation company. The job also involves me in looking after the planning and supervising of machinery and parts in line with the design plans and timescales. Most of my time is spent on site, inspecting installations and monitoring test areas. I have a degree in mechanical engineering and am a member of the Institution of Mechanical Engineers. I am continuing to study with the Institution of Mechanical Engineers as part of its Monitored Professional Development Scheme (MPDS) and am now a Chartered Member of the Institute. Since leaving university, have worked in industries concerned with the design and development of alternative (green) technologies. I am interested now in working in strategic development hence my application for this post which I understand involves being based overseas which is also of interest to me. I work as part of a team, heading up the mechanical design and test area within the R&D facility. I have good communication skills, enjoy working as part of a team, and am able to think strategically and ensure that projects are delivered on time and to budget. I enclose my CV and am available for interview at your convenience. References are available on request and I very much look forward to hearing from you as appropriate. Having read with interest your advertisement and job description, I would like to apply for the post of Mechanical Engineer. I have over six years’ experience as a mechanical engineer and as you will see from my CV, although I am currently employed, I would like to further my career by working with (company name) due to it’s reputation and to have a long, successful career with you. As part of my employment history, I have built up an impressive portfolio of achievments which I am proud of and look forward to adding my solid mechanical engineering skills and strong ork ethic to your team. I would appreciate the opportunity to work at (company name) and if you have any further questions regarding my CV or application, please do not hesitate to contact me. I am available for interview at any time.